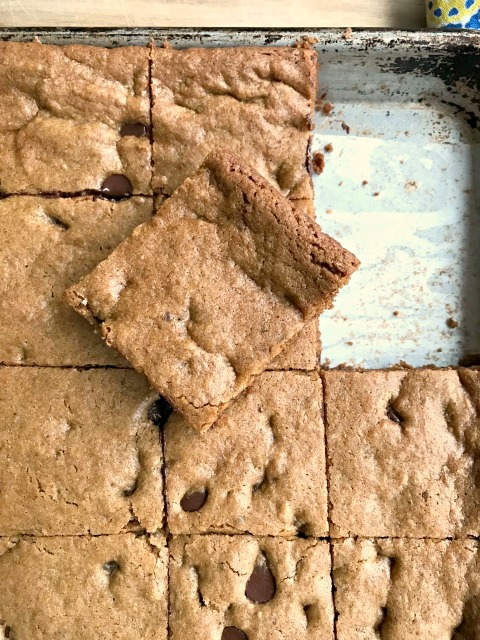 Big Batch Whole Wheat Chocolate Chip Cookie Bars are baked in an 11″ x 17″ sided baking pan so can feed a crowd. Made with olive oil, a little melted butter, whole wheat flour and flax. If you need a big batch of cookies in a hurry this is your recipe. 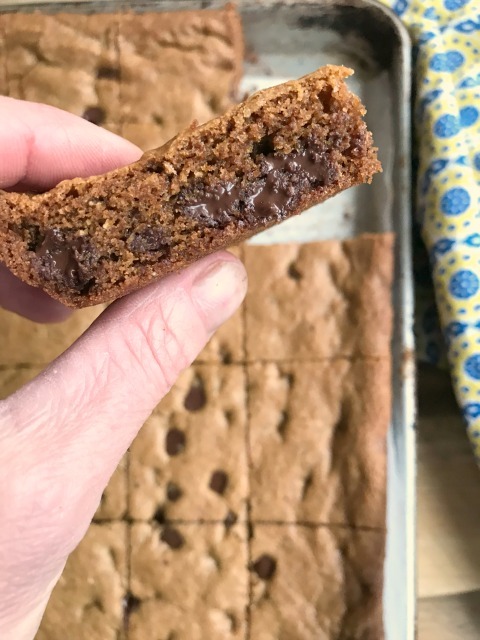 Based on a classic chocolate chip cookie recipe these whole wheat chocolate chip cookie bars have everything you love about a wholesome cookie, in a quick-to-bake bar. Sweetened with a little molasses, our whole wheat chocolate chip cookie bars have a deep caramelized flavour. Whole wheat flour and ground flax add flavour and fibre and a combination of olive oil and melted butter for the fat means that you can mix them easily by hand and don’t have to wait for butter to soften. This recipe makes a big batch. 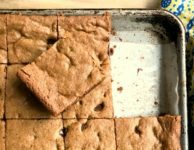 Baked in an 11″ x 17″ sided baking pan (sided cookie sheet) this recipe can easily make four dozen bars. Cut them larger and top them with a scoop of ice cream for a delicious dessert. 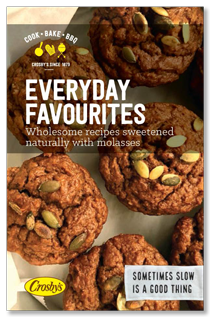 Molasses is a great ingredient in chocolate chip cookies, adding flavour and moisture. We have a whole page devoted to chocolate chip cookies.  (18 recipes and counting.) Take a look! Line a 11×17-inch baking sheet with parchment paper. In a large mixing bowl, beat together olive oil, melted butter, brown sugar, white sugar, molasses and vanilla. Stir until well combined. Stir in flours, flax, baking soda, cinnamon and salt and stir until almost combined. Add chocolate chips and stir until well combined. Sprinkle over extra chocolate chips and press into the dough. Bake for 23-25 minutes, until golden and set. Cool on a rack. Let cool before cutting.